I have to admit to being something of a late arrival to the container-gardening fan club. 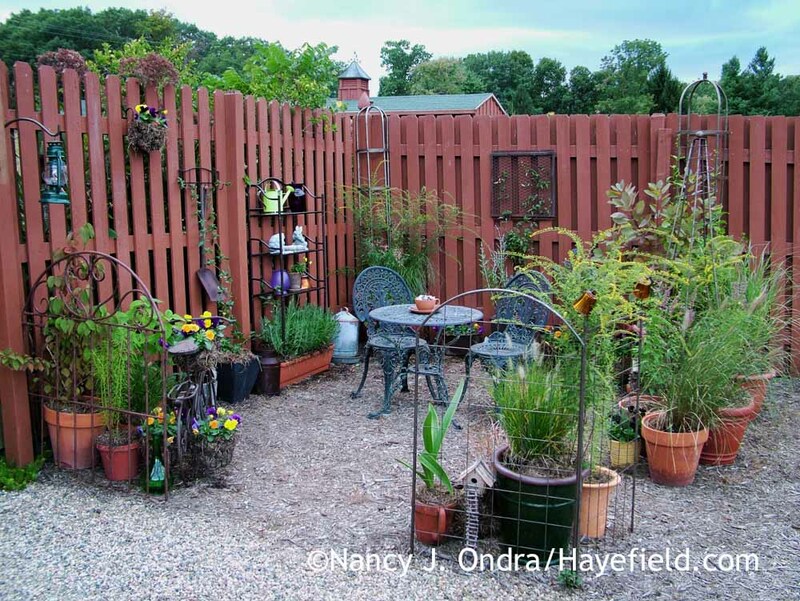 When I look back at pictures of my previous garden, I’m surprised at how few pots I had–well, except for the hundreds of potted seedlings I raised in my little backyard nursery. I mean the usual sort of container plantings: one or more decorative pots meant to add a touch of color where in-ground planting isn’t practical, such as next to a door or on a patio. I guess it’s because I was still fresh my studies of soil science and thought of pots and potting soil only as a propagation tool–a poor second to the experience of digging and planting in “real” soil. If I’d stayed there longer, maybe I’d have finally turned to containers once I’d cultivated all of the available open ground. But then it was time to move here, and with 4 acres of available space, digging was still my top priority, and my “containers” referred to the dozens of black-plastic-potted plants sitting around, waiting for permanent homes. Gradually, though, I started picking up more decorative pots here and there, and I began to realize that I’d long missed out on the many practical benefits of gardening in containers. By the time I took on the challenge of planning and planting many dozens of potted combinations for Container Theme Gardens—my most recently released collaboration with photographer Rob Cardillo–I was thoroughly hooked on the ease and versatility of this sort of above-ground gardening, and I wish I’d caught on much sooner. If I ever have to start over in a new place, you can bet that I’ll be taking along as many of my containers as I can (along with my must-keep plants, of course). 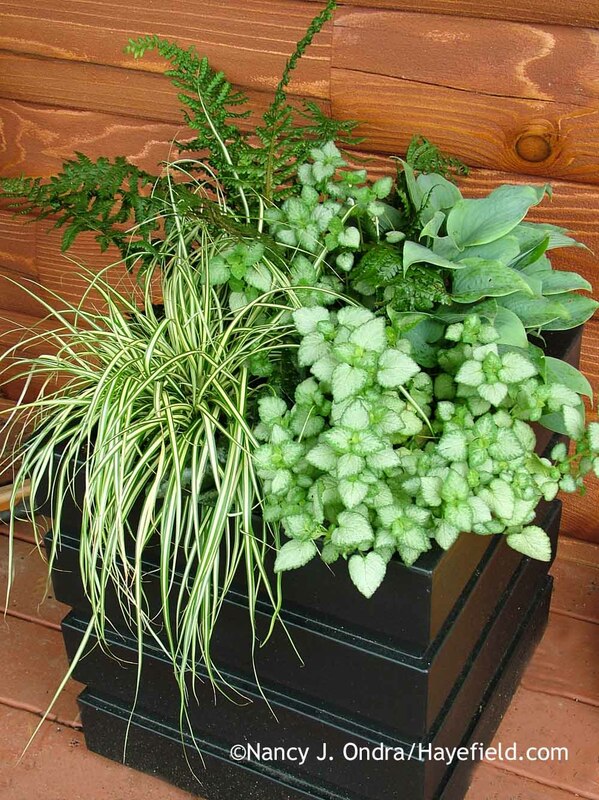 A quiet combination lets a special “investment” container be the star. 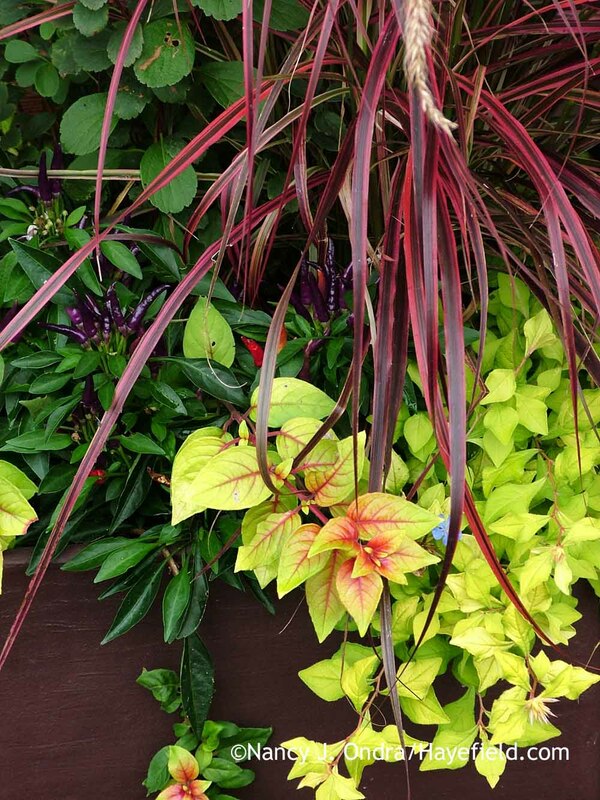 If you’d rather put your money into plants than fancy pots, that’s ok too: Use bright colors or strong contrasts to keep the attention on the planting, or include a vigorous trailing plant that will cover most or all of the container. When I hear from folks who have been drawn to the idea of gardening but simply don’t know where to start, I can’t help but encourage them to go the container-planting route too. I’d never discourage them from eventually trying in-ground gardening, of course, but containers are just so much easier. Though it’s tempting to scoff at the idea of “instant” gardens, beginners deserve to enjoy a beautiful return on their efforts too, even if their efforts involve only buying a few pots, a bag or two of growing mix, and a variety of pretty plants that catch their eye. A collection of pots can create a welcoming outdoor space where digging isn’t desirable or practical. No need for careful planning or attention to design: It’s easy enough to add, remove, or rearrange the plants as they grow and the seasons change. 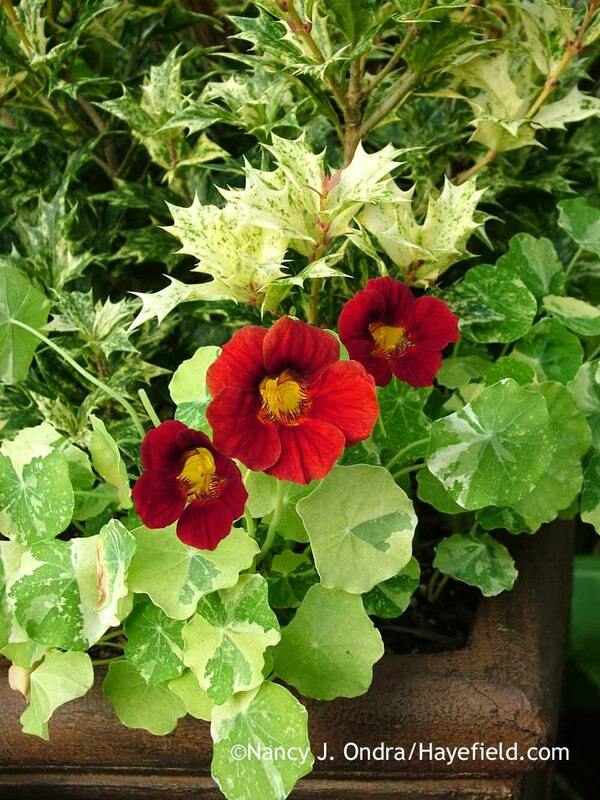 Give them a year or two of success with their containers, and once they’re firmly hooked on the pleasures of gardening, maybe they’ll be ready to face some of the harder work and larger investment of filling their yard with traditional beds and borders. Or, maybe they’ll stick with what has already worked for them and go on to expand their collection of containers. Either way, what matters is that they’re enjoying the process of planning and planting and experiencing the seasonal changes of gardening in the great outdoors; whether they go the traditional route or do all of their gardening above the ground is beside the point. Limited by time, space, or mobility? You can still enjoy puttering around with beautiful, fragrant, and flavorful plants. 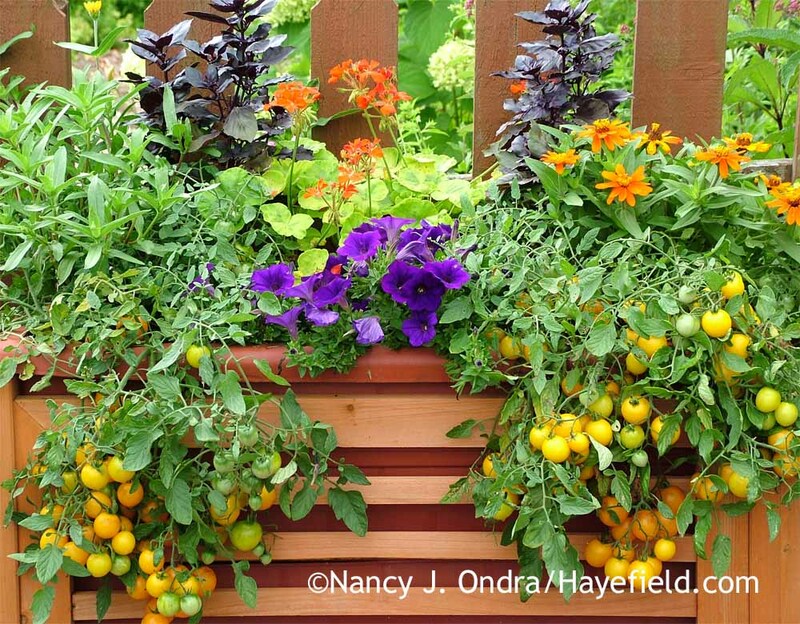 This 30″ x 15″ x 10″, “self-watering” liner in a wheeled wooden frame supported a generous abundance of ‘Osmin’ purple basil, zinnias, petunias, pelargonium, and ‘Tumbling Tom Yellow’ cherry tomatoes. Well, maybe it is a bit unfair that folks who focus on containers get to miss out on many of the expensive and disappointing mistakes that traditional gardeners have to deal with. Remember that often-repeated bit of gardening wisdom that says to wait a year or two after moving to a new place before you start digging, so you can watch the sun and shade patterns, do soil tests, and give serious thought to how you want your yard to look for years to come? It’s excellent advice, but really, who does that? We dig and plant and then learn from our mistakes when we find out that we put plants in the wrong place, or bought too few or too many, or put hours into digging a bed where we really should have put a path instead. When I think of the hundreds (or, ok, probably thousands) of plants I’ve killed over the last 30 years, I can’t help but wish I’d have been a little less eager to get them in the ground as quickly as possible. 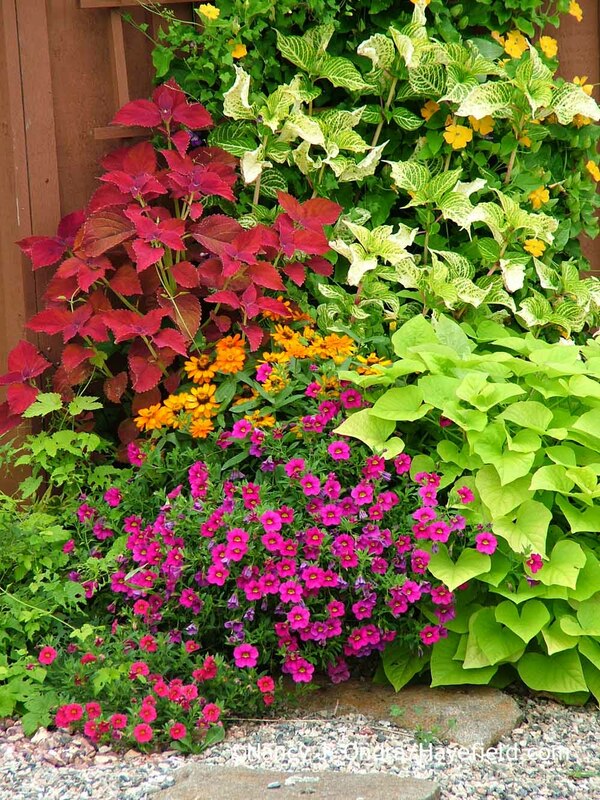 And gee–what about all of those new perennials and shrubs you splurge on at the garden center in spring, then either let sit around and get potbound or plant and lose due to forgetting to water or crowding from companions? Imagine if you had instead moved them into decorative pots, where they’d add color and seasonal interest through the summer while growing freely thanks to regular watering and ample room for root development. I’ve admired upright Japanese plum yew (Cephalotaxus harringtonia ‘Fastigiata’) for many years, so when I saw this small one at a local nursery, I just had to buy it, even though I didn’t have the right spot for it in my garden. I really enjoyed it as a container plant that year–with a few transplanted bits of European wild ginger (Asarum europaeum) as an underplanting–then found a forever home for it at the end of the growing season. Be honest, fellow gardeners, and tell me that you’ve never planted anything in the ground that you later desperately wished you hadn’t? 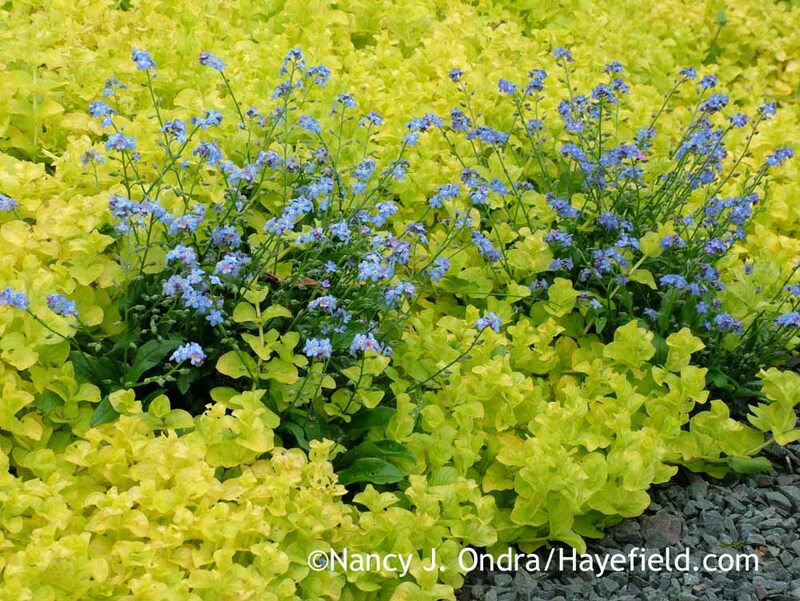 Let loose in good soil, a patch of golden creeping Jenny (Lysimachia nummularia ‘Aurea’) can quickly engulf less vigorous bedmates, such as these ‘Ultramarine’ forget-me-nots (Myosotis sylvatica). Golden creeping Jenny (Lysimachia nummularia ‘Aurea’) can be equally enthusiastic in a container, but it’s much easier to keep an eye on it there and give it a quick trim to keep it in balance with its partners. Mints are a pleasure for the senses but can spread far and wide if left unsupervised. This raised planter (an old washtub) keeps my peppermint (Mentha x piperita) and pineapple mint (M. suaveolens ‘Variegata’) under control and within easy reach for harvesting, as well. Some creepers look all cute and well behaved for a few years before they start popping up everywhere. 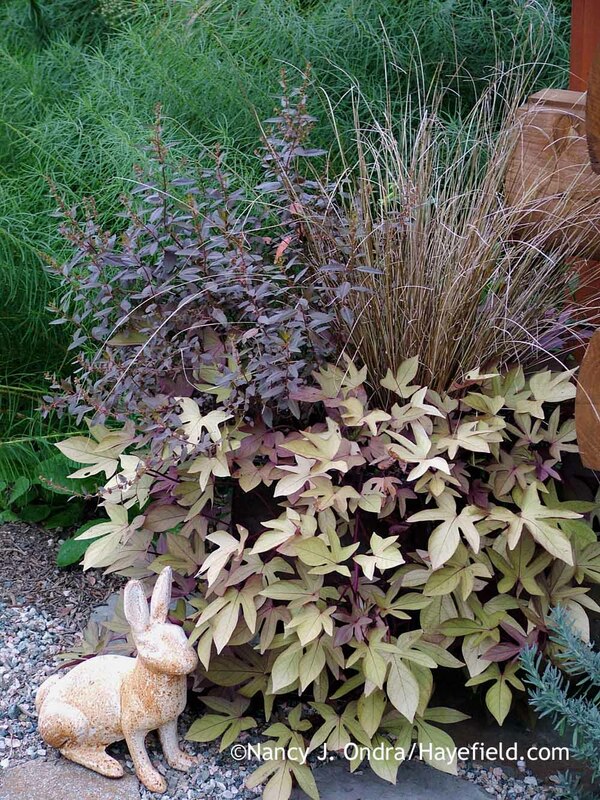 Don’t worry, bunny–we’ll keep this dwarf whitestripe bamboo (Pleioblastus variegatus) in a pot so it doesn’t get away. 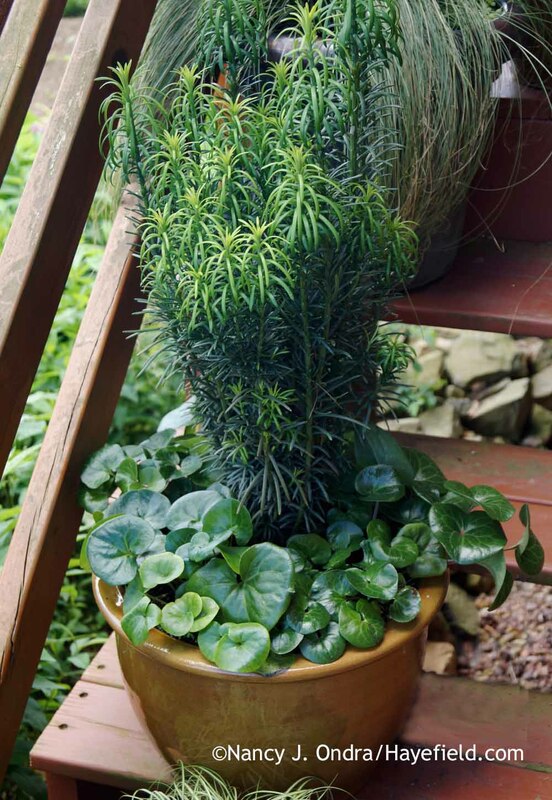 Granted, creepers are very determined, so growing them in a container isn’t a guarantee they’ll never escape: They can sneak out of drainage holes or over the rim of the pot if left unsupervised. Still, it’s much easier to keep them out of trouble if you grow them in a container instead of letting them loose in the ground. Variegated water celery (Oenanthe javanica ‘Flamingo’) is so pretty in a pot, but be sure to keep it on a hard surface, such as a deck or paved surface, where it can’t reach the soil. Let’s not even dwell on the many critter problems we deal with in our gardens. I’ve given up on growing soybeans in the ground here, for instance, because the wild rabbits will go over, under, and even through fences to get to them. In a large container, though, the plants are safe, and I am finally able to collect seed to keep several special strains going. This 18-inch-deep pot was tall enough to keep my ‘Natsu Kura Kake’ soybean plants safe from lagomorphic depradation. 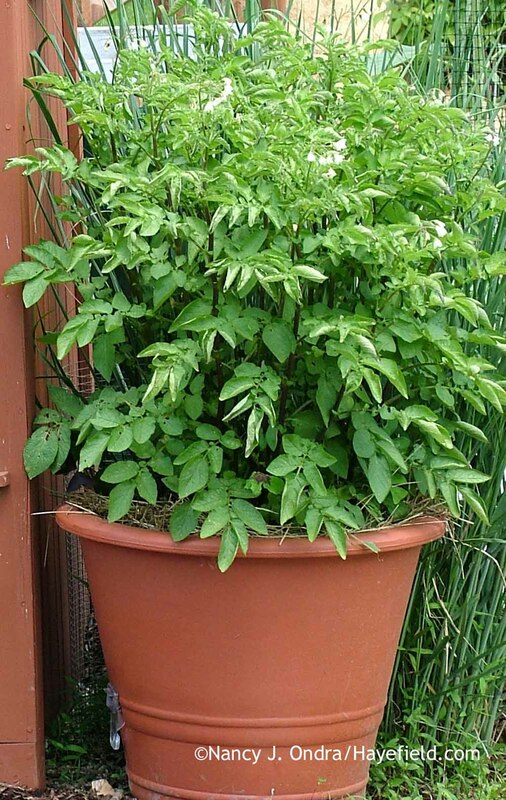 It’s tough to trick determined deer, of course, but if you desperately want to grow an ornamental or edible plant that typically gets devoured in the garden, you might be able to succeed if you keep it in a pot close to your house or up on a raised deck, where it’s out of easy reach. 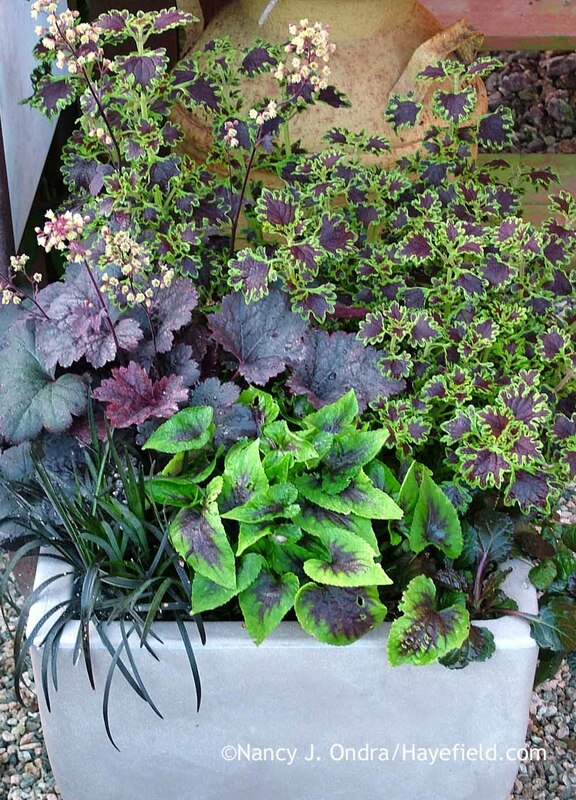 Containers that keep plants elevated can also help to reduce damage on plants that are typically slug candy, such as hostas and tender salad greens. Planting in containers doesn’t completely protect your plants from slimy slugs and snails–if you look closely, you can see a couple of holes on the young ‘Fragrant Blue’ hosta, which I foolishly assumed would be safe in this 18-inch-tall planter sitting several feet above the ground, up on my porch–but it can be easier to notice the damage and take control measures right away if pests do make the upward trek. 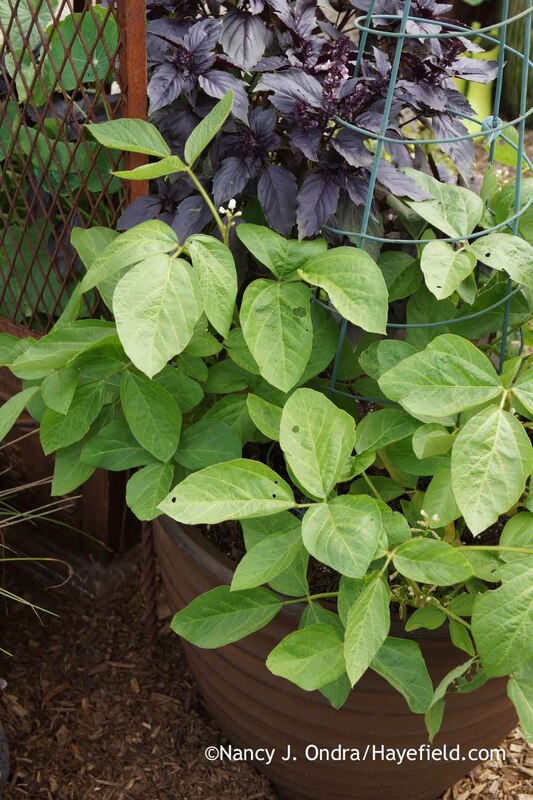 As I’ve mentioned before, I’ve learned the hard way to grow ornamental sweet potato (Ipomoea batatas) vines in containers to ensure that the voles don’t demolish them just as they’re reaching their peak lushness. Safe in this metal half-barrel planter, the big, bright leaves of ‘Sweet Georgia Heart Light Green’ sweet potato vine (Ipomoea batatas) held their own with equally vibrant companions: ‘Aloha Neon 2011’ calibrachoa, ‘Profusion Orange’ zinnia, ‘Sedona’ coleus, Iresine lindenii ‘Formosa’, and ‘Susie Orange Clear’ black-eyed Susan vine (Thunbergia alata). Speaking of potatoes…why bother struggling with growing root vegetables in compacted, clayey, or rocky soil when it’s so easy to succeed with them in containers? Both regular and sweet potatoes make good-looking additions to above-ground edible gardens, in large decorative pots or even ordinary grow bags. Growing in containers makes it easy to gather some tender young tubers for “new potatoes,” and harvesting the mature tubers at the end of the growing season is a breeze. Even relatively shallow containers can work for a crop of radishes or short-rooted carrots. I wasn’t expecting much in the way of ornamental value from these watermelon radishes, but they were actually rather handsome plants. These days, I rarely grow arugula or lettuces in the ground, because they get splashed with soil and are a bother to wash, or else I end up gathering the hay or other mulch with the leaves when I clip the greens. 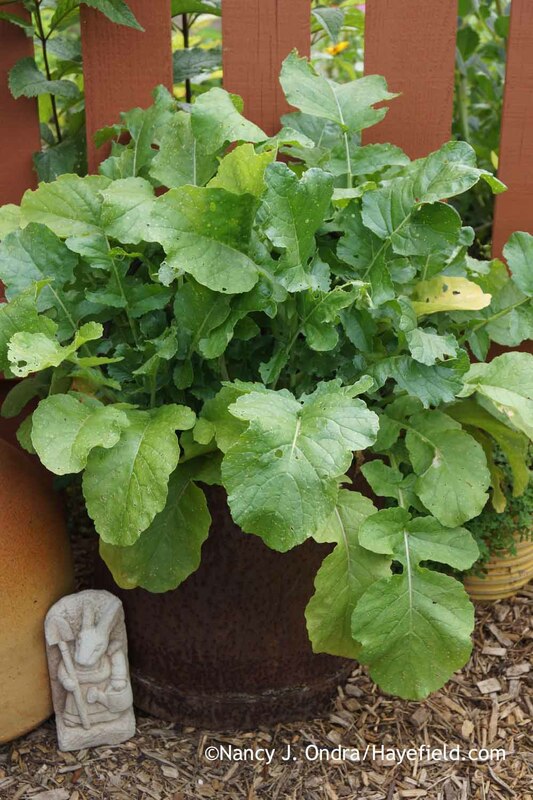 Growing small batches of arugula and other greens in containers has been a great solution. 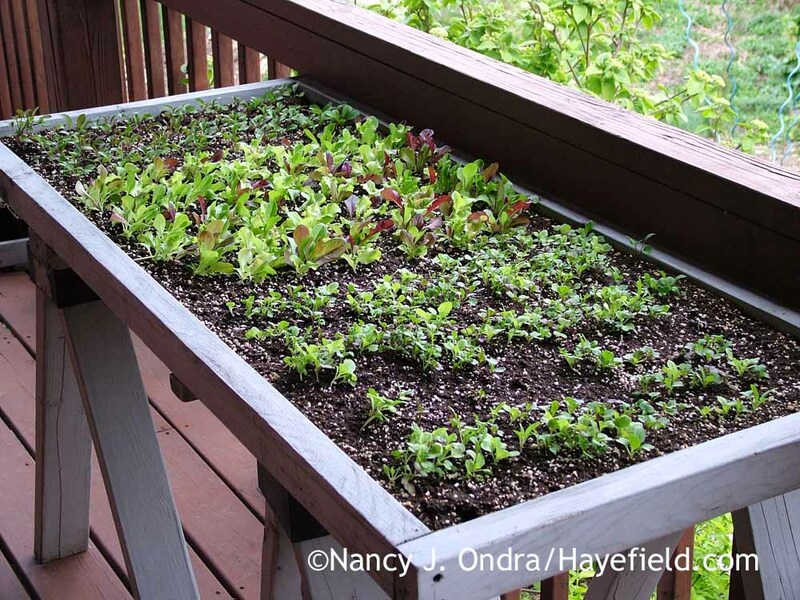 This was a past year’s experiment: using one of my nursery benches as a “salad table.” It worked out pretty well, but it took up a lot of space, so I prefer to use smaller containers for individual batches of greens. This way, the leaves stay cleaner and harvesting is easy. Plus, I can move the container to a spot with morning sun and afternoon shade to keep the crop from getting stressed by strong sun during the hottest part of the summer. Can you believe that someone put this little wagon out for the trash? It didn’t look like this at the time, of course. Once Mom made a new handle for it, spiffed it up with some fresh paint, and drilled some holes in the base, it made a cute planter. I’ve used it for collections of groundcovers, a tapestry of succulents, and, one year, a few crops of mesclun (mixed greens). 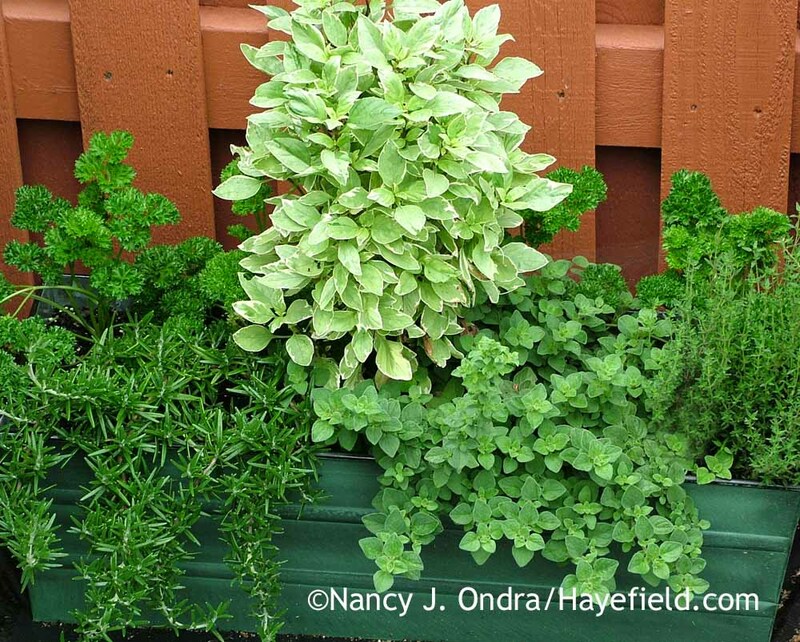 Containers are terrific for growing herbs, too. I find myself snipping culinary and tea herbs far more often when they’re in pots close to the house, rather than having to slip on shoes and trek out to the garden to gather them. A windowbox-type planter holds a variety of trailing, bushy, and upright culinary herbs and keeps them handy for quick harvesting. 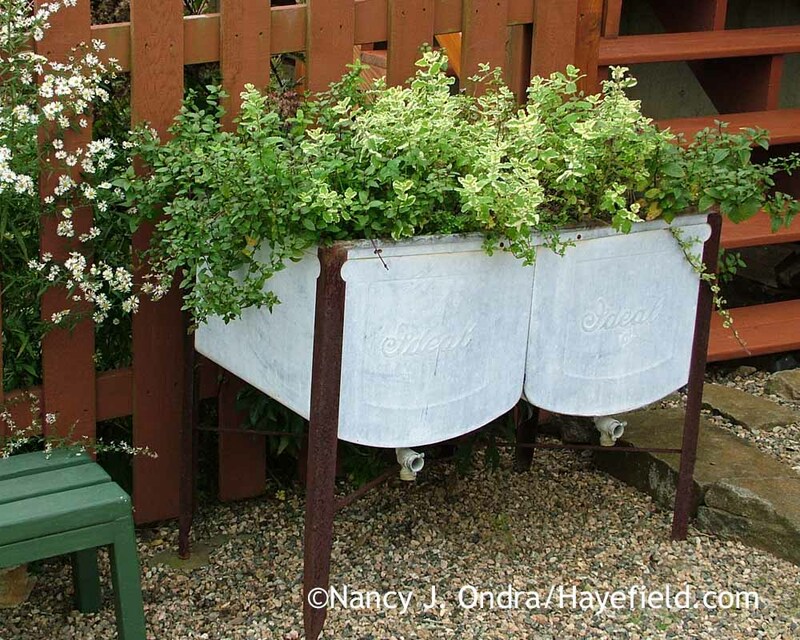 Even if you don’t pick them, growing herbs in raised pots and planters makes it easy to ruffle their leaves and release their scents as you pass by. Containers are excellent homes for fragrant flowers, too, because they lift them up closer to nose level: a big help if their scents are delicate, or if stooping or kneeling isn’t as easy as it used to be. Corsican mint (Mentha requienii) is one of my favorite fragrant plants. 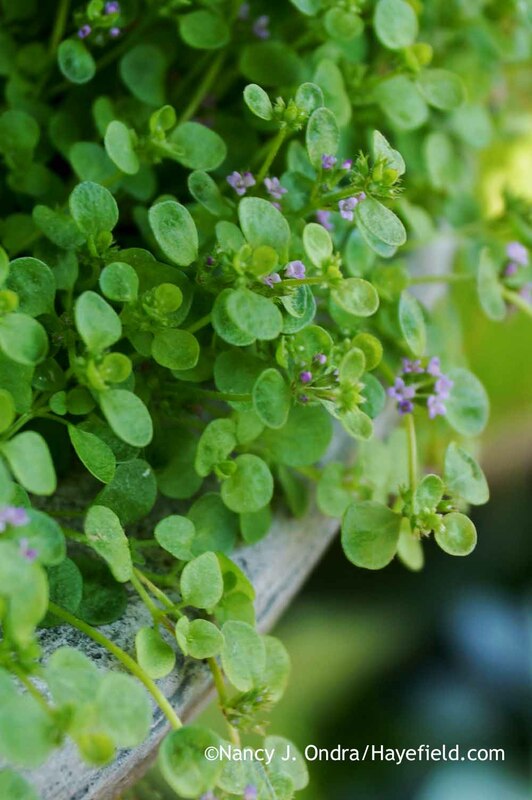 I like to keep a pot of it on my picnic table or in a raised planter, where I can easily brush the tiny leaves and release their powerful scent. It’s always good advice to stick with plants that are well suited to your yard’s growing conditions, but it can be hard to resist trying those that need more ample moisture, better drainage, or a different pH than your soil can supply without extra work in your part. 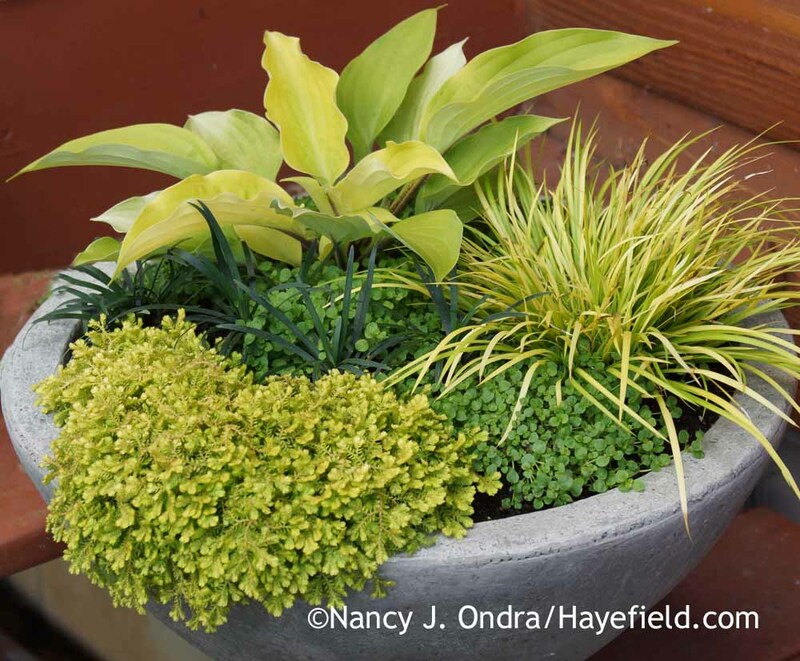 In a container, it’s not a big deal to match the growing medium to the plant, and it’s possible to keep the pot close to an outdoor faucet for frequent watering or set it in a sheltered spot to protect it from excess rain. 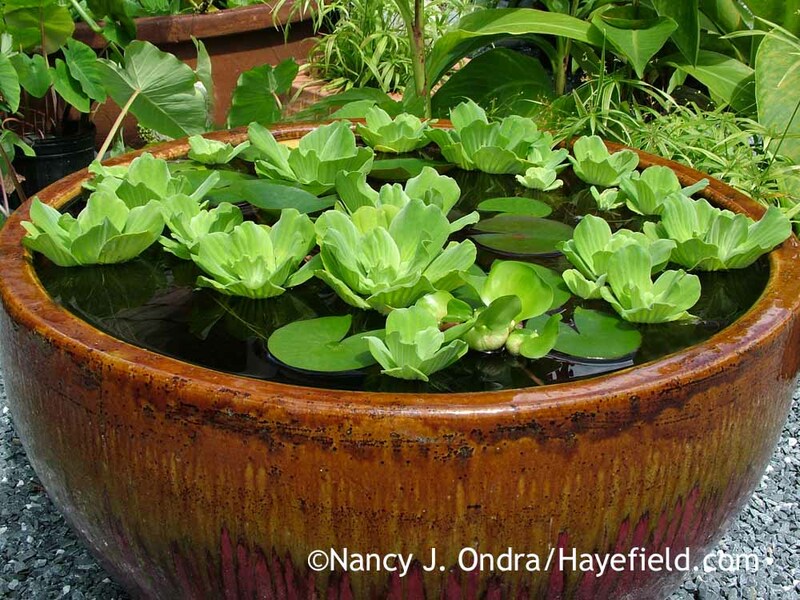 Want to give a water garden a trial run before doing some serious digging? 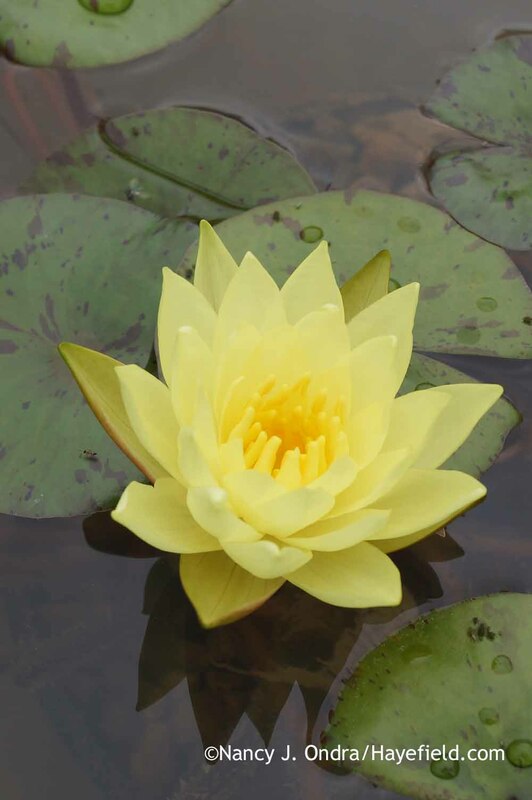 ‘Chromatella’ water lily (Nymphaea) is adaptable enough to grow beautifully in a container. I had this one in a 1-foot-deep galvanized tub. And how about those frost-tender plants, which can so easily get damaged by cold at the very start or end of the growing season? When you keep tender perennials in movable pots, it’s not a problem to bring them indoors or move them to a sheltered spot for temporary protection. 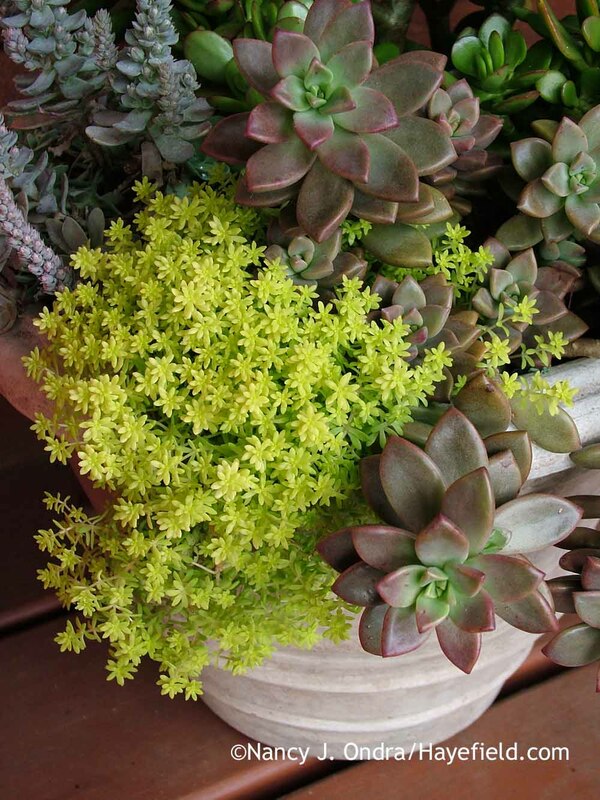 Little wonder that succulents are so popular: They’re gorgeous in the garden and exquisite in containers. It was no trouble to bring this collection of ‘Tokyo Sun’ sedum (Sedum japonicum), ‘Vera Higgins’ graptosedum (x Graptosedum), and other tender succulents indoors to protect it from our cold PA winters. Even relatively hardy annuals can appreciate a sheltered spot when an unexpected hard frost hits. If you think you might need to bring your spring things inside at some point, I suggest choosing a lightweight container–ideally, one with handles. 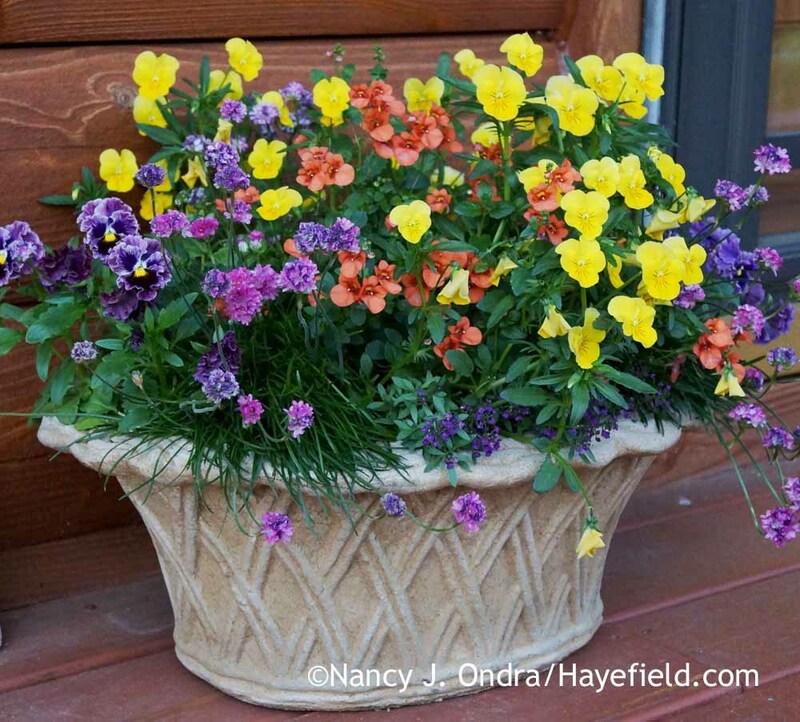 I loved the look of this cement basket planter, but carrying it around was quite a workout. If you keep dahlias, cannas, oxalis, and other tender bulbs in pots, overwintering is easy: Simply bring them inside, pot and all, and leave them in a frost-free place until it’s time to repot in spring. It’s amazing how many bulbs you can layer into a single container. And when they’re in pots, you never have to worry about forgetting to dig the tender ones that need indoor storage, or about skewering them when you dig them up in fall. In a large garden, it makes sense to focus on big plants, but it’s nice to have a special spot for tiny treasures too, so they don’t get forgotten about or smothered by more vigorous companions. This green-and-gold grouping includes ‘Fire Island’ hosta, miniature golden sweet flag (Acorus gramineus ‘Minimus Aureus’), Corsican mint (Mentha requienii), golden spikemoss (Selaginella kraussiana ‘Aurea’), and ‘Gyoku-ryu’ mondo grass (Ophiopogon japonicus). On the subject of companions…one of my favorite things about containers is the options they provide for creating and fine-tuning combinations. If you feel like indulging in a specific color theme or want to experiment with an unusual pairing, you can do it without committing to digging or reworking a whole bed. That was one of my favorite parts of working on Container Theme Gardens, in fact: what a terrific excuse for indulging in all kinds of experimental pairings! 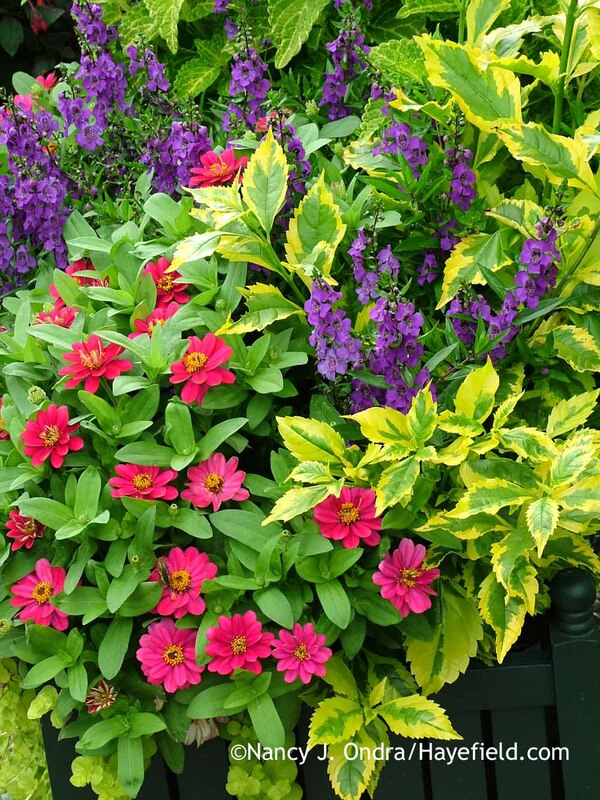 They didn’t all work out, of course, but it was easy enough to swap out one or more plants in a large container combo or, in a few cases, try a completely different grouping the following year. In the course of growing several dozen containers two years in a row, I found it much easier to maintain the larger combination planters, but I still appreciate the versatility of grouping plants growing in individual containers. The smaller pots need more careful watering, and they’re much more prone to damage in windy spots, of course, but from a design standpoint, they offer a lot more options. You can set some of the pots on bricks or other risers to vary the heights of the individual plants, for instance, and if one plant doesn’t look attractive or healthy, or if you want to make a changs for seasonal interest, it’s a simple matter to replace it with another one. 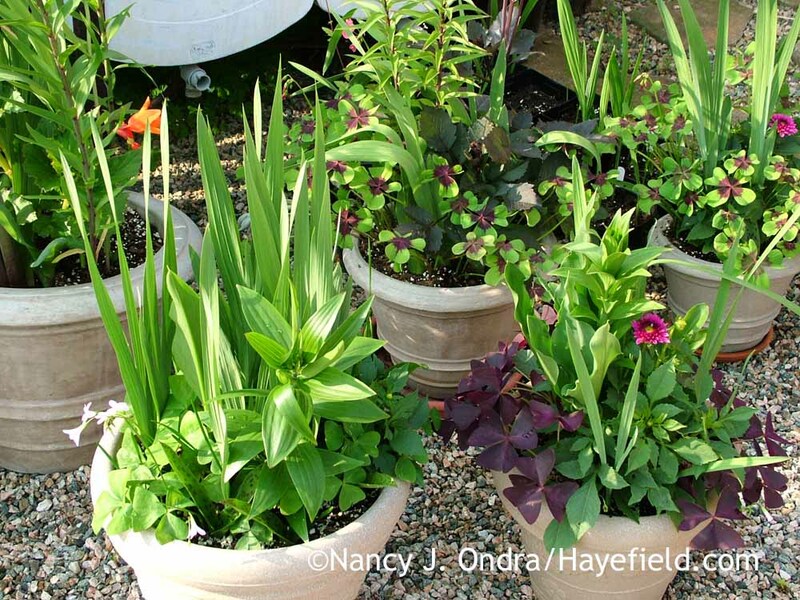 For the best of both worlds, group some larger containers with some individual pots and you can create the effect of an entire garden in a small space. 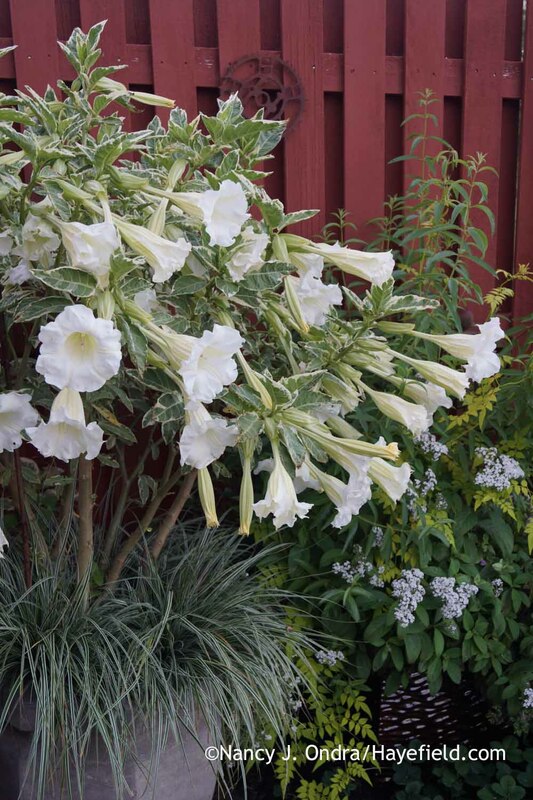 Variegated angel’s trumpet (Brugmansia suaveolens ‘Variegata’) makes a spectacular show of foliage, flowers, and fragrance in a large container. Oh my, all this thinking about the many benefits of containers has me longing to get growing right now, though the remnants of last week’s snow piles say otherwise. If you too are thinking about trying something different in your containers this year, maybe you’d enjoy flipping through Container Theme Gardens for some ideas. It’s available through independent booksellers (you can find a source that’s close to you through IndieBound), as well as online booksellers such as Books-a-Million, Barnes & Noble, and Amazon (which, by the way, has chosen it as one of its Editors’ Picks for Best Books for January 2016; hooray!). I really liked that one too. I wish the ‘Wellington Bronze’ were easier to find; growing it from seed is usually the best option. We live on a 3/4 acre lot, so borders and one garden are all I have space for. So pots add color on porches and deck and fill in when perennial beds are resting. I’ve used a strawberry pot for a salad pot near the kitchen door: lettuce, parsley and basil. Its so quick for lunch: just go out with the scissors. I’ve had some luck with potted Early Girl tomato plants on the deck. Once I had enough to make a big batch roasted tomato soup. It’s great to hear about your success with containers, Rose. One of my favorite determinate tomatoes for growing in pots is ‘Silvery Fir Tree’, with very lacy, grayish green foliage and red fruits. It’s very productive, too–though it would take a few to support a batch of soup! Beautiful plantings and a great inspiration. I have some pots I could add some plants to. Pots have a way of multiplying over the years, don’t they? 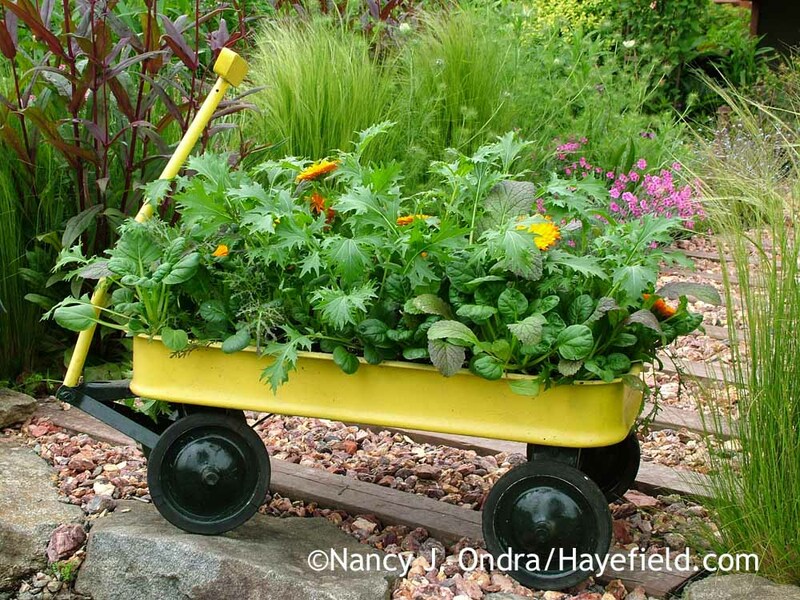 Have fun with your plantings this year! Containers now seem like such a natural evolution for the garden, a way to get it all closer to the house, to enjoy it more easily when sitting on the porch swing. I love your creative choices for containers, I can see that is the next step in my evolution as well. Yep–they’re a great place to start and an excellent adventure for experienced gardeners. What a blessing to not have to dig a new border just to have room for new combinations. Ah, thanks for the news about the name, Alan. I usually go by the RHS for nomenclature. To be honest, I’m not sure it’s even hardy here, but I’m not taking a chance! I have plenty of other things to control, trust me. What a fun surprise to find this post this morning, Nan. I couldn’t help but laugh at your comments about containing creeping plants, thinking of the chocolate mint and creeping wire vine that found their way into my garden through, ummmm, “someone’s” mistake, and would have been better left in pots! Also, this reminded me of a stunning, all-container site that was featured as one of the stops on our city neighborhood (West Seattle) garden tour a few years back. The entire “garden” was comprised of pots, mostly huge ones, on a very large, multi-level deck on the beach side of a house situated at the edge of Puget Sound. Many containers held 3 to 4 foot shrubs and trees, perhaps some bigger, which the homeowner said she had to remove and root-prune every few years. 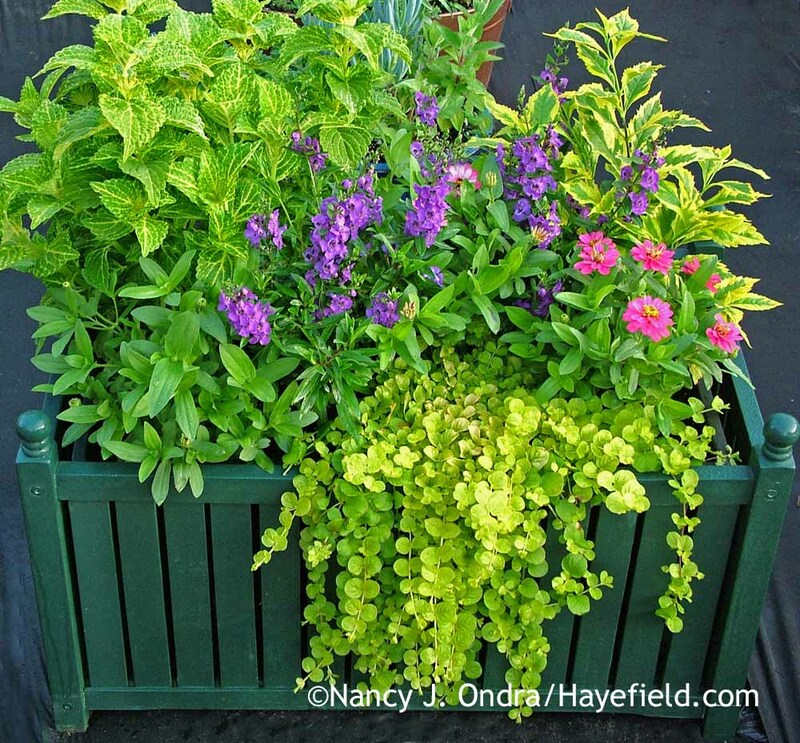 Oh, the watering and maintenance of such a container garden – but it was a stunning effect. I too have seen some amazing all-container gardens. You’re quite right about the maintenance commitment when you get into dealing with a lot of pots, or with “permanent” plantings, though! Nan, Once again your pics are so beautiful and enjoyable and leave me with lots of Inspiration and plant lust. 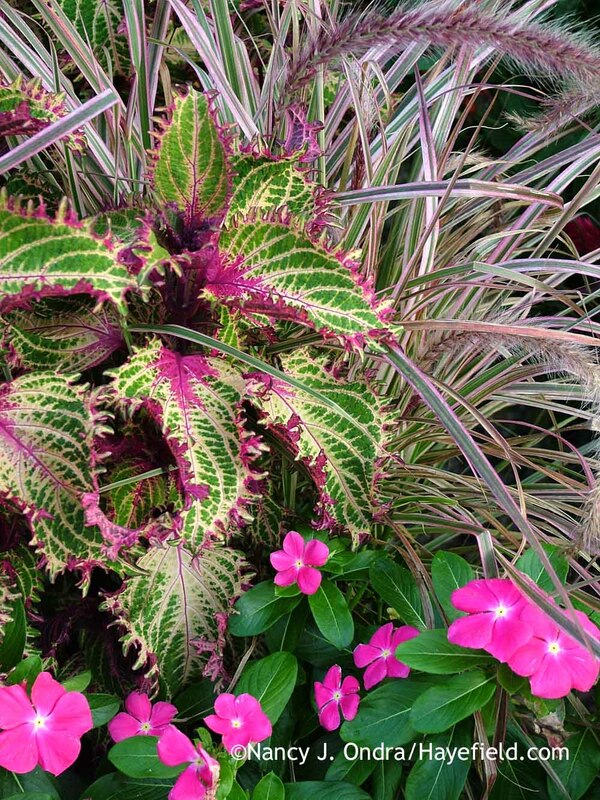 Especially for pink ruffles coleus. My major reason for containers is to fill the porches with plants and color. Also only on the back porch can plants such as cannas, coleus, caladiums, lilies etc survive, being sheltered from the seablast and wind as well as hot summer sun. Over by the pool and deck I have a few very large pots with dramatic xeriscape and salt tolerant plants as focal points. Finally, I have the herbs in pots because I really don’t want to cook with anything that may have been ‘fertilized’ with dog pee! Good to hear from you, Nicole! You don’t have to worry about plants being hardy, but you certainly have other challenges to cope with. And that’s an excellent point about keeping your herbs clean of more than garden soil! It was almost literally breathtaking in person as well, because the scent of all those flowers was really powerful. There were several other plants in that pot–a planting meant for evening interest–but you’re right about the one that’s visible being a sedge: specifically Carex oshimensis ‘Carfit01’ [Evercolor Everest]. What an opportune time for this post and for the issuance of your container book! I’ve got some new pots, plus some emptied by plant deaths or declines (even in southern California, the fancy poinsettias planted in December shine only so long outside) so I’m on the lookout for ideas to fill them. I know your book will spur my thought processes. I’m honored to think that I could provide you with any inspiration, Kris. You made me think of another cool thing about containers: Those of us who like to buy one of this and one that don’t have to worry about creating a hodgepodge. 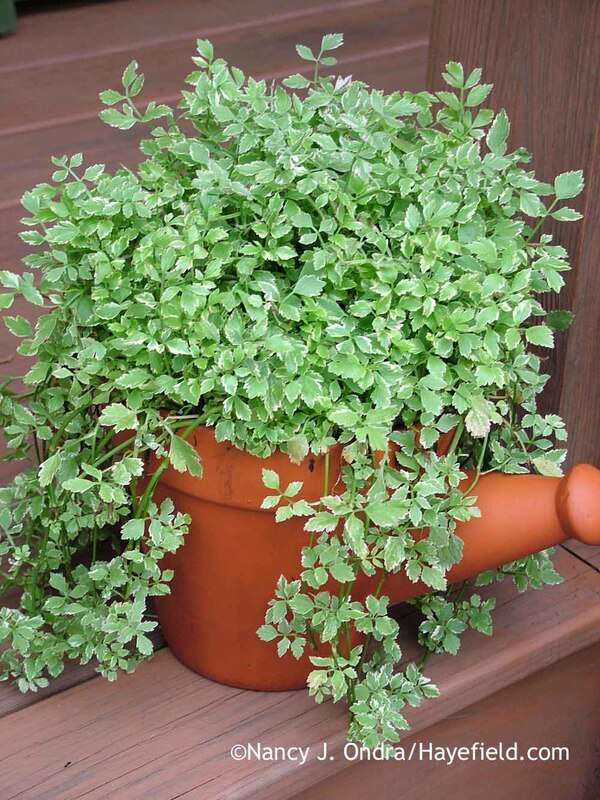 Single plants are perfectly legitimate in pots–no excuses needed! Oh, Nan! Honestly this is one of my favorite blog posts, ever. Beautiful, informative, insightful and fun. I really do love the brown combo, and heck, everything else. I have a lot of containers for tender plants I love and overwinter indoors, but my experiment in the garden this year is large (on sale!) frost-resistant containers in spots in the garden where nothing grows well. This winter is not a good test of exactly how frost resistant. Time will tell. My favorite moment was when I smiled ear to ear at the fact that we have something we share in common; having killed perhaps thousands of plants along the way! I appreciate your comment, Tim. It’ll be interesting to hear how you make out with your pots. About the mortality rate…well, in my old garden, I used to save all of the tags from plants that passed on. When I was packing to leave, I was appalled to realize that I had so many pots absolutely stuffed with tags. I’d guess there were probably several hundred from that tiny garden alone, after only 7 years. After that, I was determined not to keep physical evidence of my losses here. Thinking about it makes me feel like a crummy gardener, raising all of those plants and then being responsible for their deaths. Gardening is a passionate venture, isn’t it? We learn from our mistakes and share with others. You’ve obviously learned a lot and it shows! I have a lot of ‘what was I thinking’ moments, but I I love the adventure, the challenge and looking forward to new plant-crushes! Wonderful post. You know I have a soft spot for containers and that I have a few. It is late and I usually don’t have the chance to respond on the first day of your posts. However, I just could not go to sleep without thanking you for this unique and imaginative cornucopia of garden container ideas. I also liked your confession about the plants that did not have the will to survive. Glad to know I’m not alone. Wishing you great success with your new container book. Thanks for checking in, John, on a topic that I indeed know to be close to your heart. And the plant losses…I can’t blame the plants for not wanting to survive, but myself for putting them in the wrong place, or for not nurturing them more carefully after planting. I can see why you wouldn’t worry so much about containers what with all that property you have to plant in. I imagine planters are like jewels in your crown of planted property. Congrats on the container book chosen as an editor’s pick. Seeing all of these planters gets one to thinking about spring. Yes, with so much space to fill, I didn’t even think about the many advantages of containers back in the beginning. I wouldn’t make that mistake again if I had to start over somewhere else. Spring definitely seems close on this beautiful day we’re enjoying in PA; I hope you’re getting some sunshine too, Lisa! 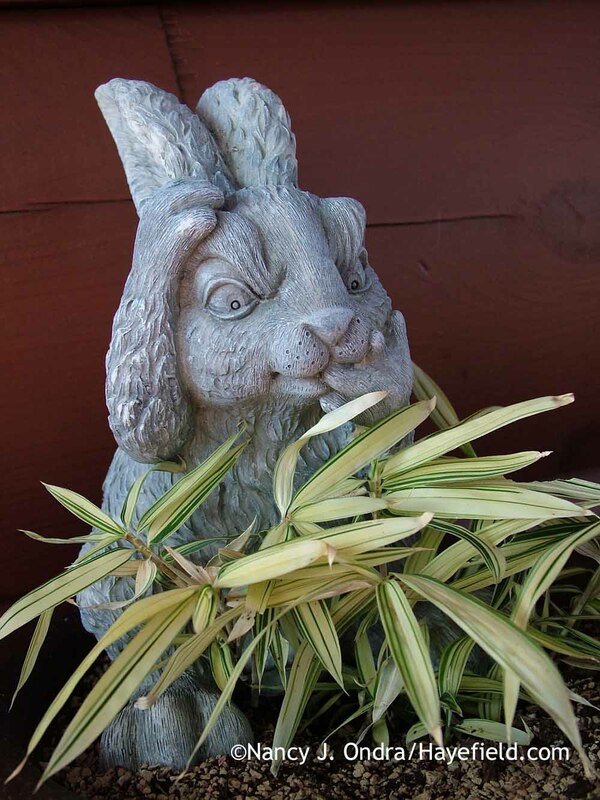 Growing in containers is probably the best way to thwart lagomorphs. I now grow edible greens and strawberries in old wheelbarrows. Nothing, however, stops the squirrels but half a harvest is better than none. My soil is hard clay with Spring flooding and high heat and humidity in Summer. so containers also work best for most Mediterranean herbs (thyme, rosemary, sage). Hope you’re well, Nan. Ah, yes – squirrels are an entirely different matter. I guess I should be grateful that’s one pest I seldom see in my garden: one advantage of having few mature trees. Thanks so much for the wheelbarrow idea. The metals ones we get these days don’t seem to last for more than a few years, and I have a couple that I could plant up this year! Yes, indeed this blog really makes a great case for using containers. I’d like to also add that they serve many flexible roles in guiding visitors through the garden, too. A pair placed symmetrically creates a formal entryway. Offset pairs -perhaps one low/near and the other higher/farther can help with pathfinding. And a colorful mixed container display in an otherwise bland planting bed can slow down the traffic as folks are drawn to inspect the collection. And the ease of moving them around during a growing season allow you to create endless new juxtapositions of color and texture to keep the garden experience dynamic. Hi Eric! Those are all excellent suggestions: even more ways to make the most of these versatile garden elements. Thanks for contributing! I’m a *lot* more successful with plants in the ground than in containers, but I’d like to change that in the next season or two. Thanks, Nell; I’m thrilled that she featured the book. Best of luck to you with your new container adventures.